In Britain, property development continues to be big business. And one industry segment which presents rich business opportunities for budding property entrepreneurs in 2018 is the care home market. Increasing demands from the UK’s ageing population – now living longer than ever before – is putting a strain on the country’s existing care homes with a disparity between the number of care home beds available and the number of care home beds needed. In fact, property experts predict 2018 is the year the care home market will hit a crisis point. Research from property consultants JLL suggests up to 3,000 elderly Britons won’t be able to get beds in UK care homes by the end of 2018. By 2026, at current market growth, there would be an additional 14,000 people in need of care home places every year. The Care Homes Construction Market offers similar findings, expecting requests for “care home places to rise steadily over the next five to 10 years”. Of course, property development isn’t a low-cost business opportunity but, if you’ve got access to capital and a desire to bring about social change, 2018 is the prime time to become a care home property developer. Becoming a care home developer in 2018 is a good business idea because there is a huge gap in the market: demand for care homes outweighs supply and is only expected to rise. In the UK, ONS figures show the population of over-85-year-olds has increased by almost a third over the last decade to approximately 1.5 million. This figure is set to grow to 3.5 million over the next 25 years. A 2017 report from The Lancet presents a more worrying forecast. Researchers found that, if rates of care home dependency remained constant, there would be almost 190,000 more people aged 65 and over in the UK requiring care by 2035 – marking a rise of 86%. To help combat this, in 2017 the Department of Health gave local authorities in England an extra £2bn “to maintain access for our growing ageing population” – including investing in care homes – by 2020. With funding crucial to become a property developer, this announcement means that you can look to local authorities for a cash injection. Outside of public funding, care homes are becoming a crowdfunding investment opportunity. In particular, crowd bonds – a type of debt-based crowdfunding – have been gaining traction for high quality care homes. Last year, crowdfunding platform Downing Crowd launched a £2.5m crowd bond for two cares homes in Scotland, and facilitated a £3m crowdfunding round for a luxury Edinburgh care home. The latter hit its target investment within just eight days. 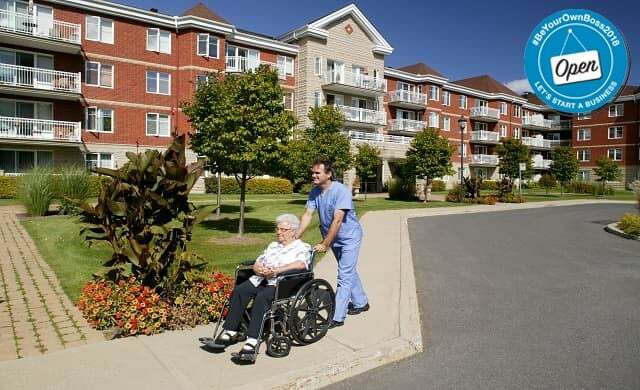 Investment firms are also becoming more active in the care home market. In June 2017, Dolphin Homes – a South coast-based care home provider for young adults with complex health needs – secured £3.85m from the Business Growth Fund (BGF). While Dolphin Homes was established back in 1988, it’s only since 2005 that the business has seen monumental growth; scaling from two care home sites to 12. More recently, in November 2017, care home provider Shaw Care secured £10m from Bridges Evergreen Investment. The UK business, started as a housing association and converted to an employee-owned company in 2006, has scaled to over 3,500 employees, 51 care homes and achieved revenues of over £90m in 2016. This demonstrates the potential rewards a care home developer could enjoy. Back in 2014, we identified boutique care homes as a hot business opportunity and that’s one potential option for budding property developers. Yet, given the high demand for beds, developing a traditional care home is likely to offer property developers a similar return on investment. There is also the option to specialise the care home services offered. For instance, Dolphin Homes caters for young adults with learning difficulties, challenging behaviour and physical disabilities, while Shaw Care specialises in services for the elderly, including those with dementia and mental health issues. While becoming a care home developer can be a lucrative business, it’s vital to remember that it involves the livelihoods of elderly and vulnerable people and you should be looking to combine profit with purpose. To set up a residential care home for adults, you’ll first need to register with the Care Quality Commission (CQC) and get a licence to operate. You can register for a licence here. Investment will be key to success and location should also factor in to your care home development venture. Knight Frank, the residential and commercial property consultancy, highlights that while “significant forward funding opportunities exist across the spectrum of healthcare registrations including care homes”, the Midlands and the North “are now target locations for operators and investors looking for a higher return on capital”. In its May 2017 specialist property market report, Knight Frank also noted that the M25 and M4 corridor remain strong areas of opportunity for the care home market. Business opportunities also exist within franchising, and come with more affordable start-up costs. Seniors Helping Seniors UK, which enables over 50s to own and run home care businesses in their local areas, has seen growth ascent. With a “low” entry price, the chain has expanded to over 40 care work providers since launching in 2014. “The UK care market is facing an imminent crisis as the sector struggles to cope with a national shortage of beds. Our research estimates that circa 6,600 care homes are at risk of closure over the next five years, which equates to 140,000 beds. It will cost approximately £15bn to build the new homes to replace these beds.